The Easter break is about to start, and we’re being inundated with customers looking a for a holiday outfit! From Lyle & Scott swim shorts and bucket hats to slip on shoes by John White and TOMS, our Spring Summer 2019 collection has everything you need for your travels. Take your pick from our recommended lines below, or browse the complete SS19 range here. If, like us, you’re sick of cheaply made swim shorts that are ugly and uncomfortable to wear, try this new short by Lyle and Scott. Ideal for lounging by the pool or on the beach, it’s made in a comfortable soft fabric and in a regular fit with an adjustable drawstring waistband. Added features include mesh interior netting and a velcro-sealed back pocket to safely secure any loose change, keys etc. Available in 3 brand new colours for SS19, including Blue and Pink (pictured). You can also wear them in Sea Foam Green. Sizes range from Small to Extra Large. 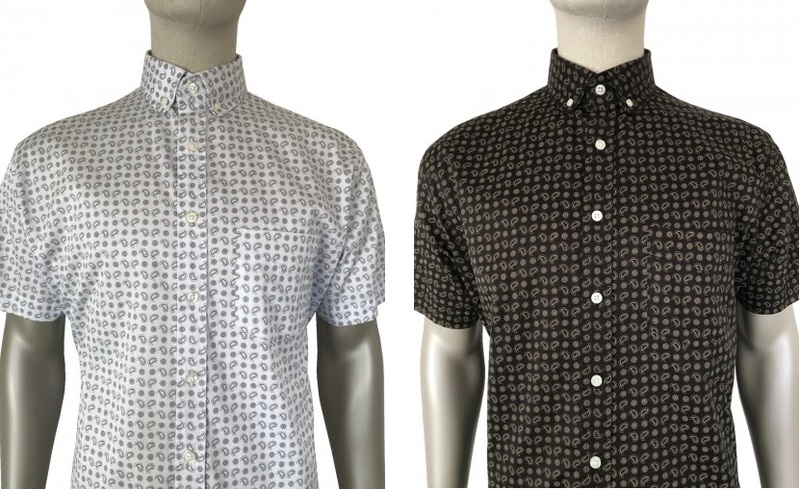 A Mod classic, these new “Penny Round” mono Paisley pattern shirts by Ska and Soul wouldn’t look out of place in Paul Weller’s wardrobe! Paisley patterns have long been a Mod favourite, especially on button-down shirts and silk scarves. This crisp 100% cotton shirt in Black and White boasts a chest pocket, and a mitred cuff with double-button detail. Some of our older customers use the pocket for cigarette packets or their glasses, but increasingly they are being used to store smart phones! Choose from three sizes in Medium, Large and Extra Large. Farah T-shirts are incredibly popular due to their vintage designs and comfortable, slightly slimmer fit. 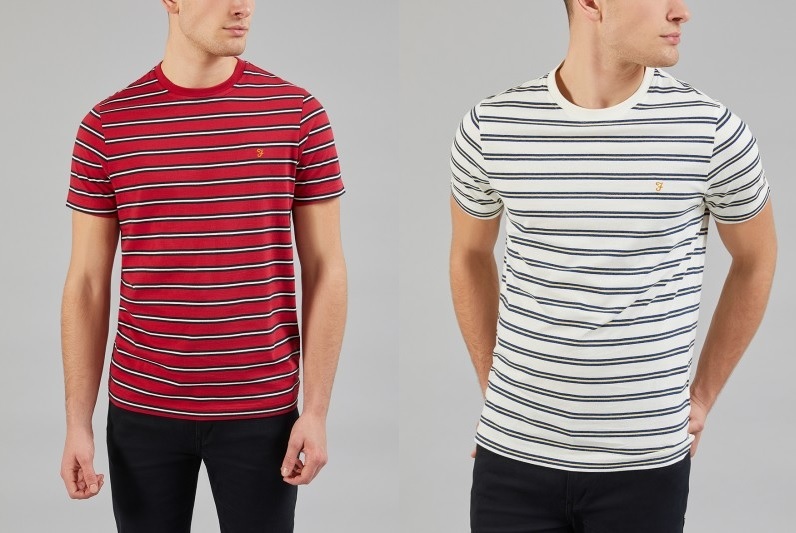 Our favourite among the Spring Summer 2019 crowd is this striped T-shirt in two colours: Fire Brick Red and Ecru. Made from high-grade 100% cotton, the T-shirts are lightweight and breathable, keeping your body cool in the hot Mediterranean sun (or the hot British sun!) In colder months they also make for a great base layer. Sizes range from Medium to Extra Large. With festival season shortly upon us — not to mention the Ashes cricket and other sporting events — you’ll need a stylish piece of headwear with a large brim. 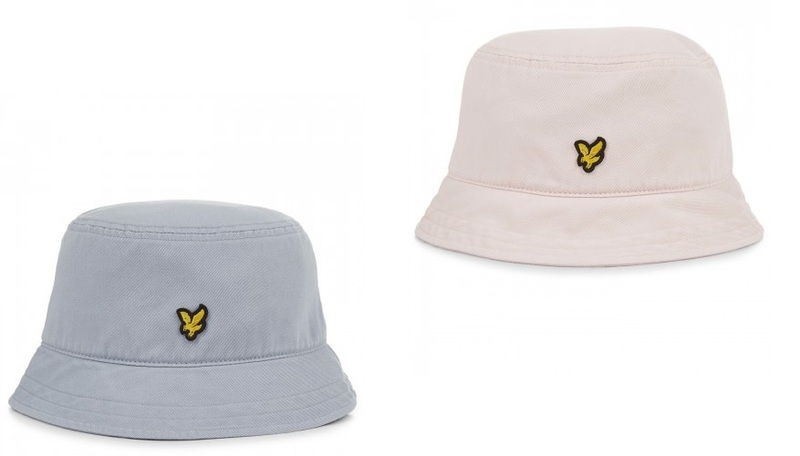 Keep the sun off your head in style with this Lyle and Scott bucket hat in Cloud Blue and Dusky Pink. Made from a durable cotton twill fabric, this headwear will might light work of direct sunlight and ensure that you stay cool for many hours. Just don’t get too drunk! Available in one size only. TOMS shoes are the ultimate summer footwear. We’ve been selling this world-famous brand for more than ten years, with the basic styles almost unchanged. 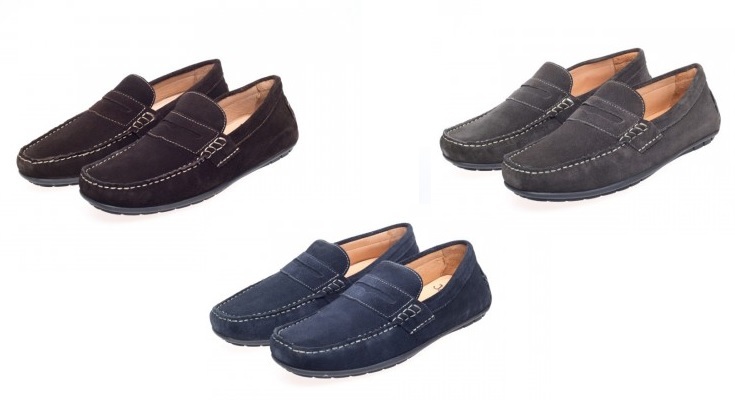 You just can’t beat the comfort of a casual slip on shoe for a warm city break or summer holiday. This season sees a brand new colour in TOMS’s “Heritage” pattern: Cherry Red with Riviera stripe lining. There’s a sole insert for extra comfort, plus an elastic “V” for ease of taking on and off. We suggest going a size down with any TOMS shoe, as they stretch out a little after wear. 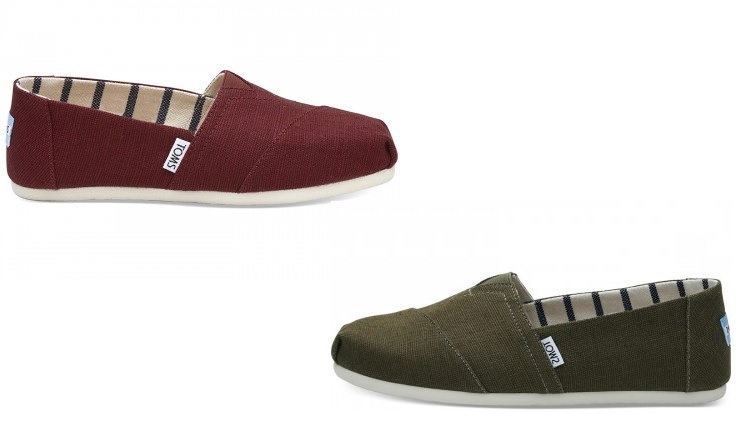 Check out our full range of TOMS colours and styles here.